Feeling crafty? Or do you just appreciate others who are? Either way, you’re going to love CRAFTED at the Port of Los Angeles, the country’s largest permanent indoor craft marketplace, located in San Pedro. And if you head over on Friday, August 24, you’ll be able to enjoy a massive Etsy craft party from 7:00 to 10:00 pm. The craft party, part of Etsy’s Craft Party 2012 global celebration, will include loads of craft projects with the expert makers of CRAFTED (a small materials fee may apply for some booths), artist demos, food trucks and a wine bar, a live DJ and photobooth, a nail bar, a tie-dye station, a message-in-a-bottle make-and-take, and of course shopping and browsing around CRAFTED market stalls. Even better: There’s no charge for admission, and parking is free. CRAFTED marks a total makeover of a classic World War II-era waterside warehouse that is now home to hundreds of individual craft artists, designers, and artisanal food makers. The artists present their unique handcrafted goods in a vibrant patchwork of market stalls. You can find apparel, art, food, jewelry, home decor, paper goods, and toys in this massive marketplace every weekend. Read more about some of the CRAFTED LA members here. CRAFTED is located at 110 & 112 East 22nd Street, San Pedro. Phone: (310) 732.1270. Click here for driving directions. Looking for a sweet ride for a sweet price? If you have a young train or car enthusiast in your family, you can’t beat the Port of L.A.’s Waterfront Red Car Line for cheap thrills – a $1 thrill, to be exact. 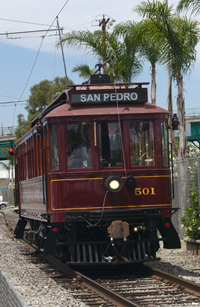 The Red Car Line is a 1.5 mile long vintage trolley line connecting San Pedro’s World Cruise Center and the Fanfare at San Pedro Gateway with other attractions along the waterfront including 6th Street and the LA Maritime Museum, Ports O’ Call, Fisherman’s Wharf, and 22nd Street. 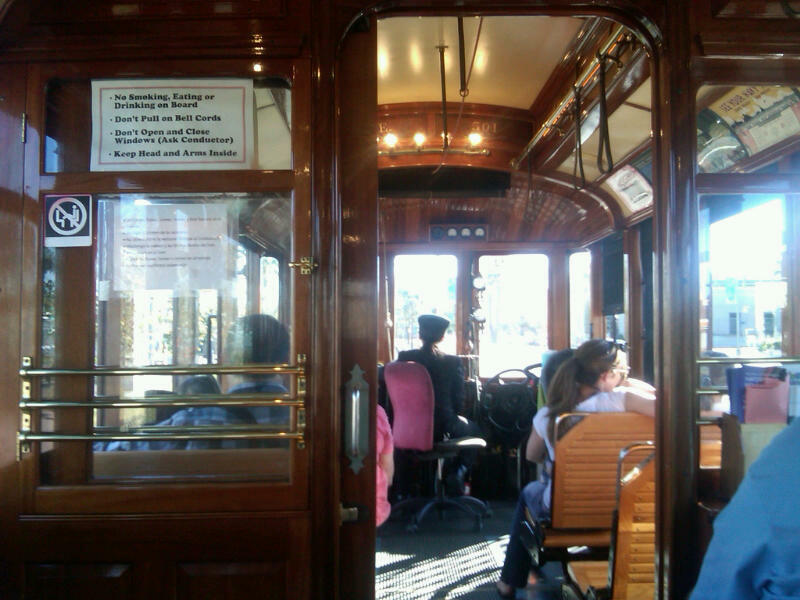 The trolleys operate from 12 PM to 9:30 PM, Friday through Sunday. Trolleys may also run on Mondays, Tuesdays, Wednesdays, and Thursdays when cruise ships are in port. The $1 fare is an all-day fare includes that gets you unlimited rides for the day. It’s a perfect ride for kids; short and sweet, with interesting scenery and stops. On our Saturday afternoon ride, Jay, the friendly conductor, gave each kid a conductor’s hat and trolley coloring book. If you’re looking for an old-fashioned romantic evening activity, try a trip on the trolley to see the nighttime performances at the Fanfare Fountain at San Pedro Gateway from 7 PM to 8 PM.